Quick, easy, arrived in no time and the final product was amazing. Gloria was attentive and quickly answered any questions I had. Will definitely work with Gloria again. 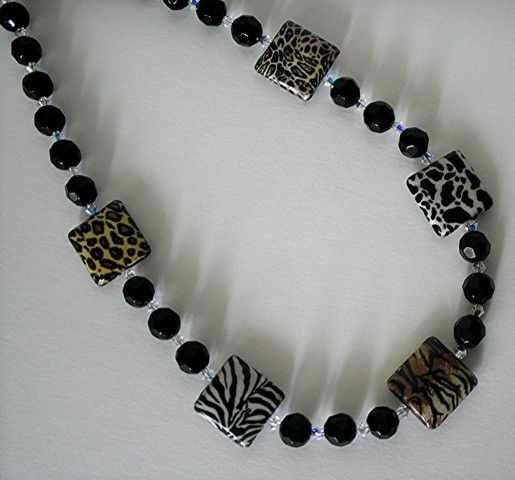 Necklace features multiple rectangular wooden beads with decoupaged animal print designs. Accented with black faceted 10mm glass beads and interspersed with genuine swarovski crystal aurora borialis 4mm beads. 18" long with a lobster claw clasp. Every maker has a story. Be a part of Royal Creations's story by placing an order, leaving a review, and seeing your review appear here.